One of the most award-winning hatchbacks of all time is the VW Golf, sold all around the world and in continuous production since 1974. The 2018 Volkswagen Golf is the latest and greatest from this storied line of fun-to-drive, efficient and practical cars — and it wipes the floor with competitors like the 2018 Ford Focus. With just a few hundred dollars separating them in MSRP, you’ll find the superior engine and interior comfort of the Golf truly set it apart. Best of all, the Volkswagen Golf is, simply, a Volkswagen. That means every single component is a masterful example of German engineering. The result is a level of quality at a price that must be experienced to be believed. So, come experience it today at Carter Volkswagen! 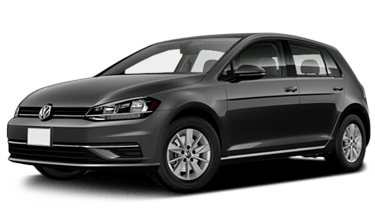 And don’t forget to browse our new car specials to see which 2018 VW Golf models are on sale now in our showroom. The 2018 VW Golf is visually striking, with premium standard features that give it a modern look. You’ll get standard LED daytime running lights and power, heated exterior mirrors with built-in turn indicators on every 2018 Volkswagen Golf. Those features will cost you extra on the 2018 Ford Focus Hatch. Step inside and you’ll find the Golf to be roomy and comfortable, with greater capacity behind the rear seats for that grocery run. Compared to the Focus Hatch, the Golf also gives you more rear seat legroom so no one has to feel cramped or crowded. The 2018 Golf even gives you a superior base infotainment display — a 6.5” touch screen comes standard, powered by VW App-Connect®. The base Focus Hatch gives you a 4.2” static display. The 2018 Volkswagen Golf gives you plenty of additional engine power compared to the base 2018 Ford Focus Hatch. Equipped with the available Triptronic® automatic transmission, the Golf even makes 199 lb/ft of torque for thrilling acceleration off the line. But where the Golf truly shines is when turning and stopping. Its low center of gravity, short wheelbase and fully independent, multi-link rear suspension make it incredibly nimble. Four-wheel disc brakes also keep your stopping distance short. 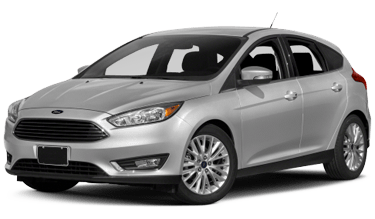 On the other hand, the Focus Hatch gives you older, drum-style brake technology on the rear wheels. With more available safety features than the 2018 Ford Focus Hatch, the 2018 VW Golf will do a better job at keeping you safe and helping you avoid mishaps on the road. Both vehicles can be equipped with many driver assistance features, but those you won’t find on any 2018 Focus Hatch include adaptive cruise control, forward collision warning and autonomous emergency braking. Those features and many more, however, are available on the Golf. And with Apple CarPlay® and Android Auto® standard on every 2018 Golf, it’s easier than ever to navigate and place calls while keeping your eyes and hands where they need to be for safe, alert driving.